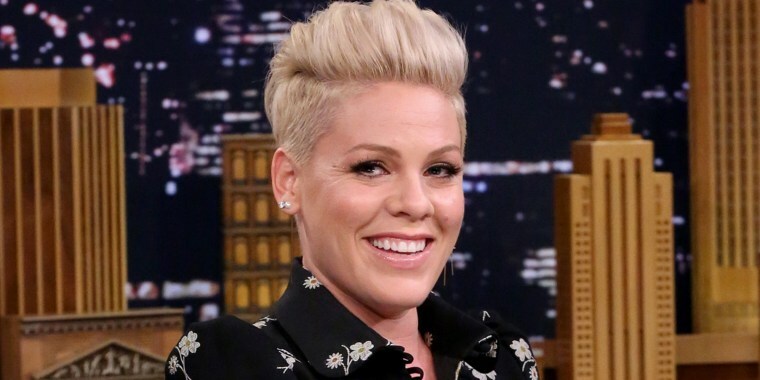 Pink opens up to Redbook magazine about juggling motherhood with her many other responsibilities. Some moms make it look so easy, and then there’s Pink, who seems like she has it all figured out with the two kids she shares with husband Carey Hart: Willow, 6, and Jameson, 1. But even she finds parenthood challenging. “I've never juggled so many damn plates in my life, but it's because I want to,” the 38-year-old singer told Redbook in a new interview. When Pink launched her latest tour earlier this year, her kids joined her. She explained to Redbook how much she enjoys being involved in their lives. “If I had nannies raising my kids and just wanted to be a rock star and party all the time, I wouldn't be successful and I wouldn't be happy,” she said. One of the things she hopes they take away from the experience is seeing their mom be the boss and work hard to realize a dream — although the second it stops working for the kids, Pink vows she’ll stop touring. “If they decide they just want to be home and have a normal life, whatever that means, I'll stop, because they are by far the priority,” she said. The crying thing is pretty common, though, as Pink joked she cries at commercials and when the wind's changing directions. “Willow won't cry ever, and it annoys me to no end,” she said, reminiscing about the time she had a heart-to-heart with her daughter who was upset and wouldn’t talk to her. Pink admitted that she finds parenting a little scary sometimes because it’s “new territory.” Her secret weapon? Friends. “I never had a group of women friends before, and that's been the most awesome thing about my 30s,” she said. See more of Pink’s musings on motherhood on Redbook's website.